Batavia,Ill.based Tour Edge Golf continues figuratively to hit’em-out-of-the-park with the next generation of their Exotics brand fairways and hybrids. Following up on the popular XCG5 modelline, the new Xrails according to the company, boast more playability, versatility and forgiveness. The Xrail fairway (street $179.99) has a wider v-sole and puts 15% more weight in the heeland toe areas than its predecessor so it has a higher moment of inertia for better stability on off-center hits. The v-sole design also minimizes divots from heavylies andlowers the Xrail’s center of gravity so shots get up and away quickly and easily. Xrail also shares with other Exotics fairways multi-metalconstruction combining a hyper-steelbody with a thinner steelface with variable thickness. The design took advantage of CAD frequency analysis to make the club more efficient which generated the clubhead’s inner architecture to give better performance across the face. 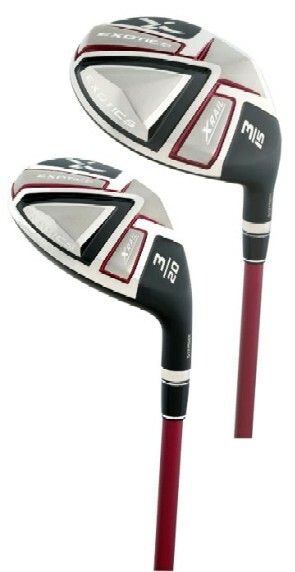 The Exotics Xrail Hybrid line (street $129.99) message from Tour Edge people is, “these are good,” …as in easy-to-hit, which is the most important single attribute for a club in the hybrid category. The two outer rails arelarger than the older models with 15% more weight for increased stability and are matched with a wider inner rail. The sole in a V-shape design minimizes divots from heavylies. Xrailhas a a hyper-steelbody and a thinner Carpenter steelface with variable face thickness for better feel.